This publication teaches homeowners and golf course personnel how to take a soil sample and interpret the soil test results to grow and maintain a health lawn. Subject include soil pH, soluble salts, and nitrogen, phosphorus and potassium recommendations. Micronutrients are also covered. The majority of the soil samples the NDSU Soil Testing Lab tests are for crop producers. Homeowners and turfgrass managers also rely on the lab for soil analyses to amend soil before planting grass seed or make soil nutrient adjustments after turf establishment. However, the interpretation of the NDSU Soil Lab test report will be different for turfgrass managers and crop producers. Homeowners and turfgrass managers can use this publication to clarify the results for the purpose of establishing and maintaining a healthy lawn. To prepare a soil sample for testing, take samples from the upper 4 to 6 inches of bare soil if establishing a new lawn and from the upper 3 inches if sampling soil from an established lawn. We recommend that you take 15 to 20 random soil samples from each area to be tested: front yard, backyard, garden, etc. Most homeowners likely won’t make that effort, but providing sufficient samples from across the entire area is important because it will ensure accurate test results. Avoid collecting from unrepresentative areas such as dog urine spots and fertilizer spills. You can use a core sampler or a hand trowel (Figure 1). Be sure to remove the thatch layer to avoid an inaccurate high-organic matter reading (Figure 2). Place the cores or trowel samples in a clean bucket and thoroughly mix together. Send about 1 pint of the mixed soil sample from each area to be tested. You can send soil samples in a plastic or paper bag or in sample bags provided by the lab. The first chemical analysis category listed on the soil test report is soil pH (Figure 3). The pH scale ranges from 0 to 14 and indicates the level of hydrogen ions in the soil solution. Active hydrogen ions (H+) cause soil acidity, while hydroxyl groups (-OH) cause soil alkalinity. Figure 3. Soil test options as they appear on the NDSU soil test report form. 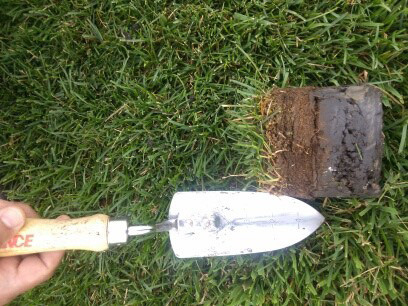 Soil sample test results for turfgrass management purposes are based on a 6-inch depth. The ideal soil pH for managing most turfgrasses is 6.5 because most nutrients are available at this slightly acidic level. However, various grass species may differ slightly from this pH level. Maintaining the proper pH is important because some vital nutrients become “fixed” (held tightly) by the soil and become unavailable to the turf as the soil pH extends above or below neutral. Although 6.5 is optimal, turfgrasses will grow and, in most cases, thrive in soils above or below that ideal benchmark as long as proper cultural practices are used. Soils in North Dakota tend to be alkaline and range as high as 8.5 to 9. At these high pH levels, turf yellowing caused by iron chlorosis is quite common because iron molecules in the soil become unavailable to turf roots. As a result, chlorophyll production in plant cells is hindered and the leaves begin to turn dull green to yellow. 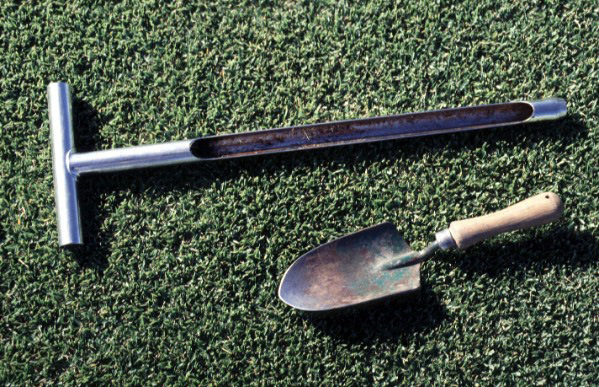 See the section on “Iron” to correct iron chlorosis of turf. Soil pH is based on a logarithmic scale. Therefore, a soil with a pH of 8.0 is 10 times more alkaline than a soil with a pH of 7.0 and a soil with a pH of 9.0 is 100 times more alkaline than a soil with a pH of 7.0. Soil pH can be adjusted downward (more acidic) with sulfur or upward (more alkaline) with lime. Refer to Table 1 for directions in using sulfur to acidify soil. Because soils in North Dakota are predominantly alkaline, the necessity to lime the soil to adjust the pH upward is extremely uncommon. Do not use lime to treat dog urine damage in lawns. 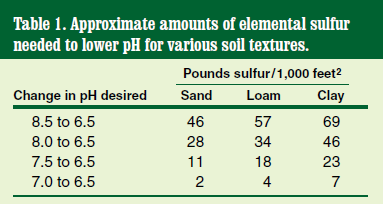 Turf managers in North Dakota typically have to incorporate a sulfur amendment to lower the soil pH. In some cases, the pH may be so alkaline (7.5 or higher) that incorporating sulfur may be ineffective because the soil’s buffering capacity (its ability to withstand chemical change) is so high that the pH cannot be corrected. Irrigation water containing high levels of dissolved carbonates also can raise the soil pH and even nullify the effects of a sulfur soil amendment. For new lawns, incorporate sulfur into soil to a depth of 6 inches before planting. For established turfgrasses, reduce the rate by half and apply only during spring or fall in conjunction with core aeration, and do not apply more than 5 pounds per 1,000 feet2 at any one time. If applying elemental sulfur to bentgrass putting greens, do not apply more than 2 pounds per 1,000 feet2 at any one time. If applying to annual bluegrass putting greens, do not apply more than 0.8 pound per 1,000 feet2 at any one time. (Fagerness et al., 1998). The next box on the soil test report notes (NO3-N lbs./A), which is pounds of nitrogen (N) per acre in the nitrate form. Although nitrate is immediately available for plant uptake, this number is not really significant to turf managers because nitrate is very mobile in the soil and can drop quickly: for example, after a heavy rain. The nitrate value reported represents available nitrogen when the soil samples were taken, and because it’s a fluid number, the soil nitrate level can change by the time you get the report back from the lab. Evidence of this would be a yellowing (chlorosis) of older turf blades even though the lab reported an adequate soil nitrate level. To ensure adequate nitrogen availability for your lawn, we recommend that homeowners apply 1 pound N per 1,000 feet2 on Memorial Day, the Fourth of July and Labor Day for a total of 3 pounds of nitrogen per 1,000 square feet per year. The Fourth of July application should be omitted if the lawn is under drought stress. Golf course superintendents often apply as much as 5 to 6 pounds N per 1,000 feet2 per year to their greens and fairways because their turf is constantly under stress from foot and vehicular traffic and is at a low mowing height. Make sure your spreader is calibrated to apply the proper amount of fertilizer per 1,000 feet2. 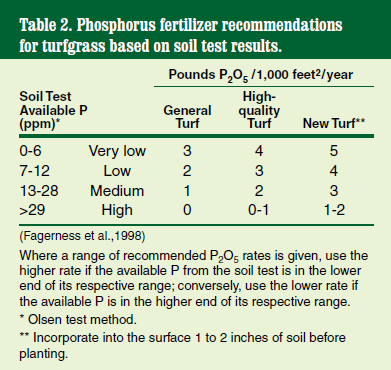 To apply nitrogen, note the first number of the analysis (the three numbers on the front of the fertilizer package represent the percent bag weight of nitrogen, phosphorus and potassium in that order). For example, a 50-pound bag of 29-3-5 fertilizer contains 14.5 pounds of nitrogen per bag (.29 x 50 pounds = 14.5 pounds N). That’s enough nitrogen to fertilize 14,500 feet2 of turfgrass. Organic matter is reported as a percent of total soil. The ideal amount of soil organic matter for turf management ranges from 2 to 4 percent and should not exceed 5 percent. About 95 percent of soil nitrogen is found in the soil organic matter (Soltanpour and Follett, 2007). However, much of this nitrogen is part of the organic matter and needs to be mineralized (to nitrate) by soil microorganisms to be available to the grass plants. About 30 pounds of nitrogen per acre (approximately 7 pounds per /1,000 feet2) will be released (mineralized to nitrate) during the growing season from each 1 percent of organic matter present (Soltanpour and Follett, 2007). Organic matter also increases the water-holding capacity and the cation-exchange capacity (CEC) of soil. The CEC is a measurement of the soil’s ability to hold cations in place and to prevent their loss from leaching and runoff. Although organic matter is beneficial when incorporated into sandy and clay soils, too much organic matter may lead to layering in the soil profile and the soil drying out quickly. Both conditions can cause poor water infiltration and puddling on the soil surface. Some examples of organic matter that can be incorporated to amend the soil are compost, sphagnum peat moss, leaves, cow manure and green manures. Spread 2 to 4 inches of organic matter on the soil surface and incorporate into the top 6 inches of soil before planting. Phosphorus is reported in parts per million (ppm). The optimum level ranges from 15 to 50 ppm. Phosphorus (P) is essential for healthy turfgrass root development. The amount required varies among soil types and maintenance regimes (Table 2). Do not apply more than 2 pounds P2O5 per 1,000 feet2 to established turf at any one time. Overapplication of phosphorus can lead to runoff into waterways, which may promote the rapid growth of dense algal blooms. Large blooms often deplete the water of oxygen because sunlight cannot reach oxygen-producing aquatic plant life below the water surface. As a result, large numbers of fish may die. Potassium is reported in parts per million (ppm). The optimum level ranges from 200 to 300 ppm. Potassium (K) is an essential component in regulating cellular electrical and water balance and controlling stomatal aperture. It’s also used as a catalyst in many chemical reactions inside and outside of the plant cells. As with phosphorus, the amount required varies among soil types and maintenance regimes (Table 3). Electrical conductivity (EC), reported in millimhos per centimeter (mmhos/cm), is a unit of conductivity and indicates the amount of salt in the soil extract. Soil EC can range from 0 to 50 mmhos/cm (seawater). An increase in EC or mmhos/cm represents an increase in soil salt content. 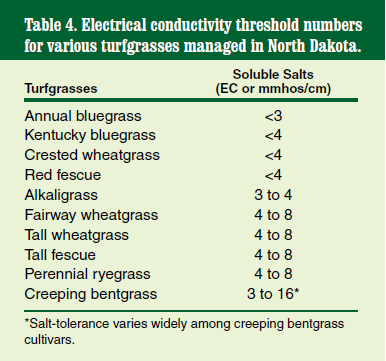 Table 4 provides the EC threshold number for various turfgrass species managed in North Dakota. Soil salinity can be caused by poor-quality irrigation water, lack of precipitation and capillary wicking from a high water table. Soils in western North Dakota tend to be saline because of low precipitation and because the local soil parent materials are of old marine origin. Not enough rain water is available to leach the salts from the soil that accumulates as plant biomass, such as leaves and roots decay. Upward (capillary) wicking is the primary cause of soil salinity in eastern North Dakota. The eastern part of the state has a high water table; in some areas, it is as shallow as 3 feet below the soil surface. The shallow water table raises during heavy rain events, bringing salts up to the soil surface. After the rain stops, the water table recedes, but the salts remain at or below the soil surface due to water evaporation from the surface. Irrigation with water containing salts also can cause soil salinity. Many groundwater irrigation water sources are saline, and excessive irrigation with these water sources can create salinity problems. The easiest way to remediate a saline soil is to leach it with good-quality water (low in dissolved salts and sodium). However, this simple remedy may not be possible if good-quality water is not available at the problem site. 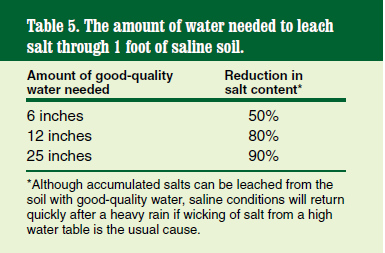 Refer to Table 5 for the amount of good-quality water required to leach a saline soil of accumulated salt. Do not incorporate gypsum to remediate soil salinity. Gypsum should be used only to remediate sodic or saline sodic soil conditions. Please contact your local NDSU Extension agent for more information on sodic soils. Zinc, reported in parts per million (ppm), is rarely deficient in turf. A number below 20 ppm is considered low, while 20 to 50 ppm is sufficient for managing turf. If a deficiency occurs, elemental zinc (Zn2) can be applied as a minor nutrient application. Zinc toxicity on turf is more common than deficiencies, especially if composts containing high levels of zinc are used. Iron, reported in parts per million (ppm), is plentiful in our soil but often deficient in turfgrass and other ornamental plants because it often becomes unavailable in alkaline soil. Iron (Fe) is an element found in several primary plant molecules, including chloroplasts and hemoglobin, which are responsible for photosynthesis and oxygen transport respectively. The NDSU Soil Testing Lab uses the diethylenetriaminepentaacetic acid (DTPA) extraction method. According to that method, a test result at or less than 2.5 ppm is considered to be low, 2.6 to 5 ppm is considered medium and greater than 5 ppm is high (sufficient) (Carrow et al., 2001a). Iron-deficient turfgrass has a mottled, yellowish/greenish (chlorotic) appearance, compared with a nitrogen-deficient turf, which is uniformly yellowish/greenish across the turf canopy. For iron-deficient turf, a foliar application of actual iron can be applied at 0.012 to 0.024 pound per /1,000 feet2 in 1 to 5 gallons of water as often as needed (Carrow et. al, 2001b). Use the lower rate when the air temperature exceeds 85 F, and avoid foliar applications of iron when the turf is under stress because burning can occur. Also avoid foliar applications if rain is imminent. Do not irrigate for three to four hours afterward to allow the leaves to absorb the iron. You also can use iron sulfate at 0.25 pound iron per 1,000 feet2. Green-up should occur in 24 to 48 hours and last about two weeks. If the soil pH is greater than 7.2, use Fe-EDDHA. Several EDDHA [ethylenediamine-N,N'-bis (2-hydroxyphenylacetic acid)]-based iron chelate products such as Sequestar 6% that are available at garden centers and online outlets can be applied by homeowners to treat iron-deficient turf. The only method to remediate an iron-deficient soil is to acidify it with sulfur. Refer to the sulfur section and Table 1 of this publication for rates. Kentucky bluegrass can appear to be chlorotic after green-up in early spring in North Dakota because the roots are too cold to absorb an adequate amount of iron. You don’t need to apply iron at that time. The turf will green up uniformly once the soil warms to 50 to 55 F.
Manganese is reported in parts per million. The optimal soil range is 1 to 2+ ppm. Like iron, manganese (Mn) is an element involved in the synthesis of chlorophyll. Turfgrass will become chlorotic while subjected to a Mn deficiency because it will cause a disruption of the photosynthetic process, which leads to yellowing of the leaf tissue. Deficiencies can occur on alkaline soils with a high pH. Manganese can be applied as a granular fertilizer or a fertilizer minor. Minors consist of the following essential nutrients: boron (B), chlorine (Cl), copper (Cu), iron (Fe), nickle (Ni), manganese (Mn), molybdenum (Mo) and zinc (Zn) but are required by the plant in lesser amounts. If a minor is added to a plant fertilizer, it is listed as a fourth number in the analysis and often followed by the element’s symbol in parenthesis. Manganese also can be applied in a liquid foliar formulation. Apply manganese sulfate monohydrate (MnSO4·H2O) at 0.025 pound actual Mn per 1,000 feet2 in 1 to 3 gallons of water (Carrow et. al, 2001c). Copper is reported in ppm. Most soils typically contain between 1 and 40 ppm of total copper. The NDSU Soil Testing Lab uses the DTPA extraction method to detect copper micronutrient availability. If the amount of available copper in the soil is less than 0.2, it is considered low; if it is 0.2 to 0.4, it is considered medium; and if it is greater than 0.4, it is high. If a deficiency is detected, apply a foliar application at 0.13 pound per /acre or 0.003 pound per /1,000 feet2. Copper is used for chlorophyll formation and also catalyzes several chemical reactions. Deficiencies are uncommon but can occur on heavily leached sands and organic soils because of strong binding sites that fix the copper molecules, making them unavailable for root uptake (Carrow et. al, 2001d). To avoid toxic levels, do not apply copper unless a true deficiency has been identified. Copper toxicity can hinder the turf’s ability to absorb iron and cause chlorotic conditions. Apply a foliar treatment to a small area and observe the response for a week before treating the entire site. The NDSU Soil Testing Lab reports sulfur in pounds of sulfur per acre in the sulfate (SO4) form. The lab uses calcium phosphate (Ca(H2PO4)2) to extract sulfate from the soil. Therefore, a moderate range would be 20 to 40 pounds per /acre (.46 to .92 pound per 1,000 feet2) (Carrow and Duncan, 2011). Sulfur’s primary role in plants is in the formation of cysteine and methionine, two amino acids that are required in many physiological functions and chemical reactions. The Clean Air Act and subsequent amendments to that law imposed reductions on sulfur dioxide (SO2) emissions. Prior to the Clean Air Act, soil sulfur deficiencies were considered rare in the U.S. except on sandy soils. At that time, many industries in the U.S. burned high-sulfur fossil fuels, especially in coal-burning power plants and smelting plants. The heavy sulfur dioxide emissions from these industries settled to the Earth’s surface during rainfall in amounts that exceeded the demands of turfgrass (Christians, 2011). The new federal regulations require fossil fuel-burning industries to reduce sulfur dioxide emissions by employing a number of strategies, including the installation of more efficient lime scrubbers in their smokestacks to reduce ozone-depleting gas emissions, including sulfate and sulfur dioxide, into the atmosphere. Sulfur dioxide deposition in North Dakota within recent years has ranged from 0.036 to 0.045 pound per 1,000 feet2 (National Atmospheric Deposition Program, 2016). Therefore, sulfur applications may be required in North Dakota to prevent deficiencies. Elemental and other reduced forms of sulfur must be oxidized by soil microbes into sulfate before it is available for root uptake. This oxidation may take a year or more. Therefore, sulfate fertilizers such as ammonium sulfate, potassium sulfate (K2SO4) or magnesium sulfate (MgSO4) should be applied to treat a sulfur deficiency because they are immediately available to the turf. An application of 0.5 to 2 pounds of granular sulfur per year per 1,000 feet2 is usually sufficient. A foliar application of 0.05 pound S (as K2SO4) in 3 to 5 gallons of water per 1,000 feet2 also may be used. The application of sulfur should provide a greening response within one to three days if it is deficient (Carrow et al, 2001e). The NDSU soil test analysis reports chloride (Cl) in pounds per acre. Chloride is involved in cell multiplication in leaf tissue and water splitting during the photosynthetic process. Draining chlorinated swimming pool water on your lawn is unlikely to damage turfgrass or provide any beneficial effects. Carrow, R.N., and R. Duncan. 2011. Best management practices for saline and sodic turfgrass soils: Assessment and reclamation. p. 79. CRC Press, Boca Raton, Fla.
Carrow, R.N., D.V. Waddington and P.E. Rieke. 2001a. Turfgrass soil fertility and chemical problems. p. 251. Wiley, Hoboken, N.J.
Carrow, R.N., D.V. Waddington and P.E. Rieke. 2001b. Turfgrass soil fertility and chemical problems. pp. 354-355. Wiley, Hoboken, N.J.
Carrow, R.N., D.V. Waddington and P.E. Rieke. 2001c. Turfgrass soil fertility and chemical problems. p. 253. Wiley, Hoboken, N.J.
Carrow, R.N., D.V. Waddington and P.E. Rieke. 2001d. Turfgrass soil fertility and chemical problems. p. 251. Wiley, Hoboken, N.J.
Carrow, R.N., D.V. Waddington and P.E. Rieke. 2001e. Turfgrass soil fertility and chemical problems. p. 242. Wiley, Hoboken, N.J.
Christians, N.E. 2011. Fundamentals of turfgrass management. p. 163. Wiley, Hoboken, N.J.
Fagerness, M., S. Keeley and D. Whitney. 1998. 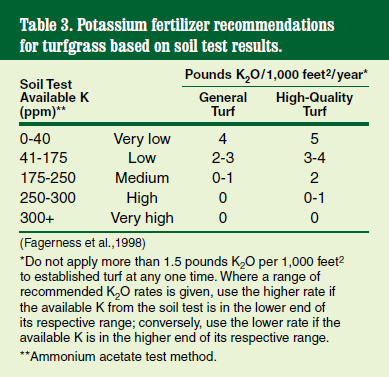 A guide to turfgrass nutrient recommendations. Kansas State University Cooperative Extension bulletin MF-2311. National Atmospheric Deposition Program. 2016 (cited for this bulletin on Oct. 24, 2016). Soltanpour, P.N., and R.H. Follett. 2007. Soil test explanation. Colorado State University Cooperative Extension Service.